Home » Financial News » Can You Afford to Live Without a Budget? Political pundits have spent the last several days and weeks leading up to the federal budget speculating on the impact it will have on the country. Many observers have been focusing on Canadian families, and how the new Liberal government’s financial policies will affect them. But according to Jeff Schwartz, executive director of Consolidated Credit Counseling Services of Canada, there is another budget that will have a far greater impact on your family – your own. Schwartz points to a recent report, in which the Financial Consumer Agency of Canada (FCAC) found that only 46 per cent of Canadians have a budget. According to Schwartz, it is no coincidence that the Canadian Payroll Association reports that a similar amount of Canadians (48 per cent) are living paycheque-to-paycheque. Data suggests that Canadians are not only failing to reach their financial destinations, they are driving off financial cliffs. Government numbers show that insolvencies were up three per cent in 2015, with some parts of the country well above that mark. Schwartz says a proper budget is one of the best tools available to protect Canadians against insolvency and financial ruin. He and his team of trained credit counsellors perform free budget analyses on a daily basis for Canadians coast to coast. Audit your spending. Go through your bank and credit card statements and find out where your money is actually going. There could be some shockers in there – lunches and cell phone bills are usual suspects. 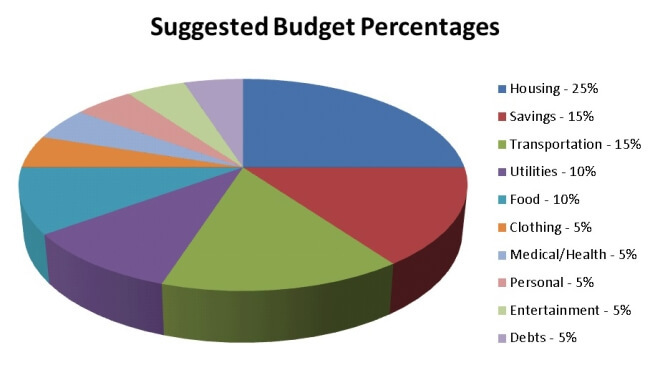 Check these amounts against Consolidated Credit’s recommended budget percentages to see where you stand. Divvy up your income. Add up all forms of income – include child support, government support, interest, spousal income, and others – and use the recommended budgeting percentages to see how much you should be spending on each line item. Check these amounts against your audit. Be frugal if necessary. If the first two steps show that you are spending way too much money, you need to make some lifestyle adjustments. Look for ways to save on everyday expenses – they will add up. The Consolidated Credit website is full of tips and tricks, and blogs such as FrugalFrieda.com are great places to start. Use the tools available. Ask your bank to help you set up automatic paycheque deductions to help you meet your savings goals. Use apps to help track your spending on-the-go. A pen and paper may be basic tools but they are also effective in helping you control your spending and maximizing your income. Seek help if you need it. Finances can feel like a taboo subject, but don’t be too proud to reach out for help. If you have followed these steps but are still facing serious problems, reach out to one of our trained credit counsellors by calling 1-888-294-3130 to receive confidential and professional advice, free of charge.